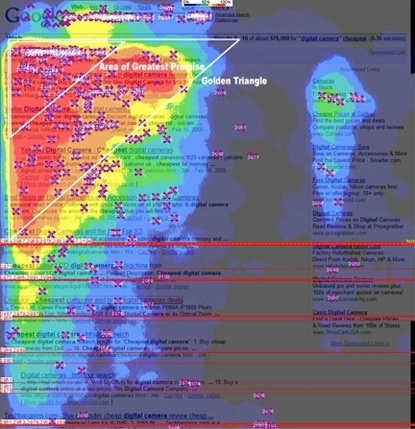 In search marketing circles, most everyone has heard of Google’s Golden Triangle. It even has its own Wikipedia entry (which is more than I can say). The “Triangle” is rapidly coming up to its 10th birthday (it was March of 2005 when Didit and Enquiro -- now Mediative -- first released the study). Another study from the Institute of Communication and Media Research in Cologne, Germany also looked at the evolution of search user behaviors. I’ll run through the findings of both studies to see if the Golden Triangle still exists. But before we dive in, let’s look back at the original study. To understand why the Golden Triangle appeared in the first place, you have to understand how humans look for relevant information. For this, I’m borrowing heavily from Peter Pirolli and Stuart Card at PARC and their Information Foraging Theory (by the way, absolutely every online marketer, web designer and usability consultant should be intimately familiar with this theory). Humans “forage” for information. In doing so, they are very judicious about how much effort they expend to find the available information. This is largely a subconscious activity, with our eyes rapidly scanning for cues of relevance. Pirolli and Card refer to this as “information scent.” Picture a field mouse scrambling across a table looking for morsels to eat, and you’ll have an appropriate mental context in which to understand the concept of information foraging. In most online contexts, our initial evaluation of the amount of scent on a page takes no more than a second or two. In that time, we also find the areas that promise the greatest scent and go directly to them. To use our mouse analogy, the first thing she does is to scurry quickly across the table and see where the scent of possible food is the greatest. Now, imagine that same mouse comes back day after day to the same table -- and every time she returns, she finds the greatest amount of food is always in the same corner. After a week or so, she learns that she doesn’t have to scurry across the entire table. All she has to do is go directly to that corner and start there. If, by some fluke, there is no food there, then the mouse can again check out the rest of the table to see if there are better offerings elsewhere. The mouse has been conditioned to go directly to the “Area of Greatest Promise” first. This was exactly the case when we did the first eye-tracking study in 2005. Google had set a table of available information, but it always put the best information in the upper left corner. We became conditioned to go directly to the Area of Greatest Promise. The triangle shape came about because of the conventions of how we read in the Western world. We read top to bottom, left to right. So, to pick up information scent, we would first scan down the beginning of each of the top four or five listings. If we saw something that seemed to be a good match, we would scan across the title of the listing. If it was still a good match, we would quickly scan the description and the URL. If Google was doing its job right, there would be more of this lateral scanning on the top listing than there would be on the subsequent listings. This F-shaped scanning strategy would naturally produce the Golden Triangle scanning pattern we saw. There was another behavior we saw that helped explain the heat maps that emerged. Our ability to actively compare options requires us to hold in our mind information about each of the options. This means that the number of options we can compare at any one time is restricted by the limits of our working memory. George Miller, in a famous paper in 1956, determined this to be seven pieces of information, plus or minus two. The actual number depends on the type of information to be retained and the dimension of variability. In search foraging, the dimension is relevance, and the inputs to the calculation will be quick judgments of information scent based on a split-second scan of the listing. This is a fairly complex assessment, so we found the number of options to be compared at once by the user tends to max out to about three or four listings. Scanning activity drops dramatically after the first four listings. In our original study, we found that over 80% of first clicks on all the results pages tested came from the top four listings. This is also likely why Google restricted the number of paid ads shown above organic to three at the most. So, that’s a quick summary of our findings from the 2005 study. Next week, we’ll look how search scanning has changed in the past nine years.